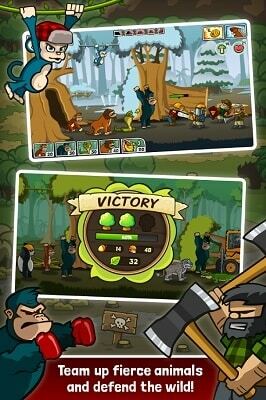 Lumberwhack: Defend the Wild is a tower defence offering for mobile devices that has you controlling the creatures of the jungle as they fend off all sorts of lumberjacks that seek to carve up your habitat for profit. Playing as Koko Kornelius players will move their character across the top of the treeline, firing coconuts on the advancing lumberjacks below. In addition Koko can call upon more than 10 animal friends to help on the ground floor with the likes of other apes, lions, tigers, snakes and much more. Recruiting your friends though will drain your banana resources which will spawn around the map and also generate slowly over time. 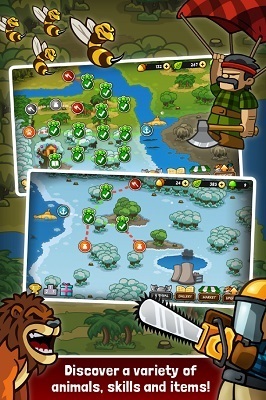 Players will find the lumberjacks as equally diverse with certain animals being more suited to countering particular enemies, requiring players to carefully consider the friends they call on to assist. Gameplay is stage based with players able to bring 4 animals to each fight with them along with any of Koko’s unlocked skills. Considering the makeup of your opponent is the key to success here. Unlocking new animals and skills and the order you do so is also a strategy consideration in Lumberwhack with stages often split into branching paths that could see you unlock a new skill first or taking a different route for a new animal instead. Further customisation is offered to enhance your strategy through the upgrade system that can give your animals extra damage and health or improve upon one of your special skills. These upgrades are handled through the leaf currency which is awarded for winning levels and achievements. A second currency (golden acorns) allows you to purchase things before they are unlocked through the campaign or temporary level power ups. Both of these currencies are handed out at a reasonable level, especially if you make use of the free doubles for watching a short ad. While the design of Lumberwhack: Defend the Wild is on the more simple side of side scrolling tower defence the large number of levels (200) and huge array of upgrades make it one you can come back to for small bursts again and again. Reclaim the forest and save it from the lumberjacks. Recruit all sorts of animals and upgrade them. Use the skills of Koko to assist your summoned friends. Free Android and iOS game app.